I have no idea why, but all of a sudden I am obsessed with bento box lunches. According to Cooking Cute, bento "refers to a packaged, single-portion, portable meal that is usually eaten at lunch, but also comes in larger sizes meant for use at picnics, dinner, and parties. A bento generally consists of rice or noodles and some form of protein (e.g., meat, poultry, fish, tofu) accompanied by side dishes of raw, simmered, or pickled vegetables. 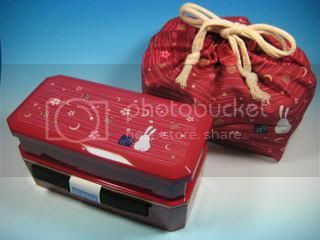 There are many different types of bento boxes, ranging from traditional handcrafted wooden lacquerware to disposable containers. 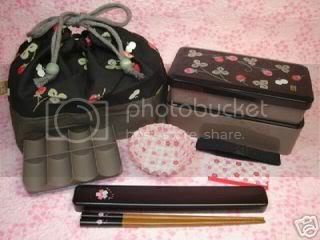 Most bento boxes have compartments or internal dividers for separate dishes." 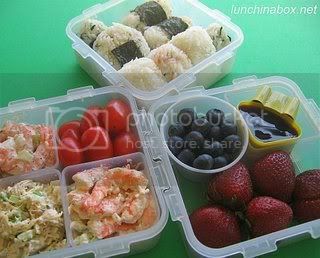 I came across a few pictures of bento box lunches on Tastespotting, which led me to click around and discover this whole cyber-world of bento packing cooks! Cooking Cute has a great list of links and resources. 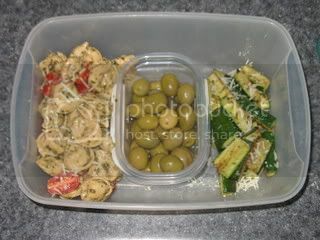 Lunch in a Box offers tips & techniques for bento fillers. 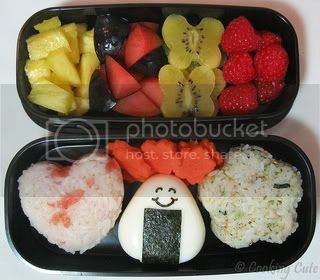 Soy and Pepper features mouth-watering pics of her bento love. Some people even go as far as to press hard-boiled eggs and rice into hearts, cut veggies into flowers, and decorate their food with pieces of seaweed! Anyway, I've always been fond of taking lunches in snazzy lunchboxes. 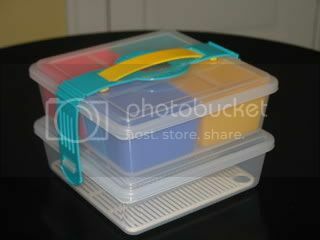 In high school, my best friend and I both had these cool tall, rectangular, colorful plastic boxes with long straps. There were three pieces to each box: the top was a thermos, the middle divider held napkins & silverware, and the main compartment was big enough to pack food in. 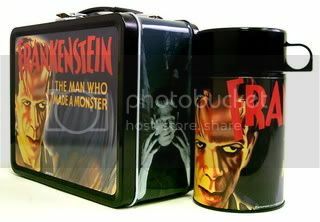 A few years ago I bought a traditional metal Frankenstein themed lunchbox to commemorate earning my MA in English (I wrote my thesis on Frankenstein). 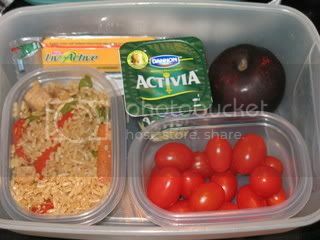 I've decided to take my lunches to work from now on, so as to eat a bit healthier (ie, no fast food), and I love the idea of packing bento boxes! 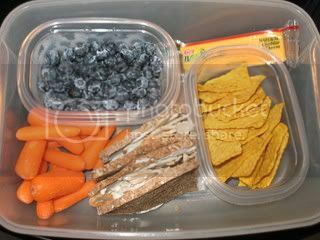 I also liked the Laptop Lunchbox system (available at Lunchboxes.com) and the Fit & Fresh containers (available on Amazon). In fact, I might order the Fit & Fresh soup/salad thermos and possibly the Breakfast Chiller. Their Lunch on the Go is microwaveable and includes an ice pack. Since I didn't yet have a real bento box, I improvised the past week by using small Gladware containers inside a larger, heavy plastic containter with a lid (something I already had in my cabinet for storing leftovers in the fridge). Leftover chicken stirfry, grape tomatoes, cheese, yogurt, & a plum. Turkey & Laughing Cow cheese on sunflower bread, veggie crisps, carrots, blueberries, & cheese. Whole wheat cheese tortellini with tomatoes & pesto, cardamom & cinnamon olives, roasted zucchini with thyme. Nothing too exciting, but I have some fancy recipes planned for the coming weeks! 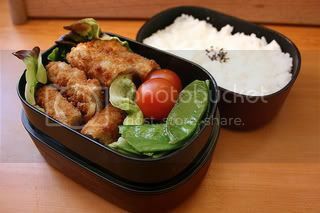 Look for more bento pics and recipes here soon! Whee! I love bento! The kids like it too. I have far more bento stuff in my house than I care to confess to at the moment, but suffice it to say there are two drawers and a cabinet dedicated to storage of bento stuffies. 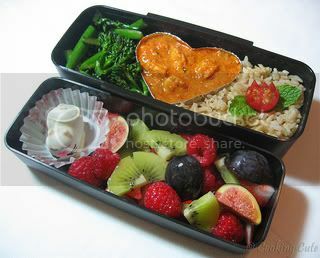 There's a great bento community (bentolunch) on Livejournal that posts oodles of boxes if you want inspiration.